With one more day before the conference was scheduled to start, we went back to Tiananmen Square, this time taking the subway to the right stop. The square is indeed very large, and surrounded by a number of monumental building. To the north there is the main gate to the Forbidden City (see panorama below), the entrance we used the day before to visit the Palace Museum. On the opposite site there is the imposing Zhengyangmen (正陽門), or "the gate of the zenith sun". The gate once guarded the south entrance to the inner city, as part of Beijing historic city walls. The walls are now gone, but the gate is still an important geographic marker along the north-south axis of the city. First built in 1419 during the Ming dynasty, the gate guarded the entrance to the imperial city. In 1900 the gate was destroyed during the Boxer rebellion, when a Chinese militia rebelled against foreign imperialism and Christian missionaries. The rebellion was crushed during the battle of Beijing, when an Eight-Nation Alliance invaded the city: the tower played a prominent role during the fighting. Zhengyangmen was later reconstructed by the Qing dynasty, in direct violation of the Boxer protocol (one of the "Unequal Treaties" imposed to China by the invading powers). The tower of course is not the only prominent building in the square. 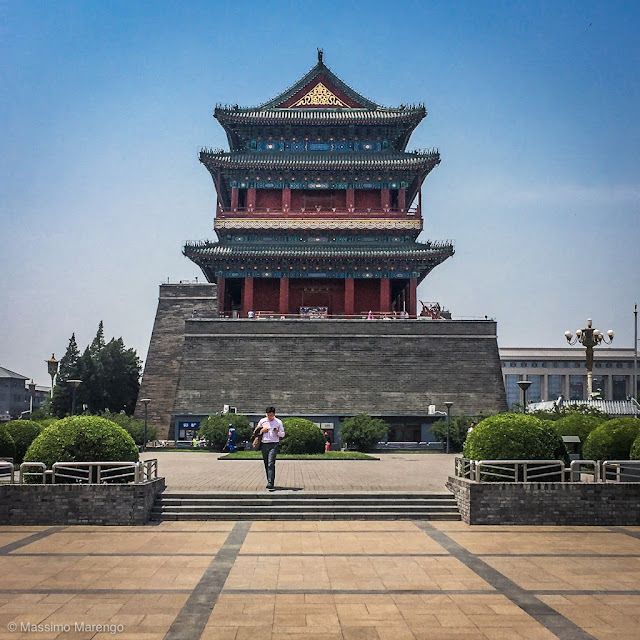 The equally imposing Chairman Mao Memorial Hall (毛主席紀念堂) stands at the center of the Square, with the crystal coffin where the embalmed body of the "Great Helmsman" is visited by the millions (kind of ironic given that Mao himself wished to be buried). A very controversial historical figure abroad, Mao Zedong is still very popular in China. 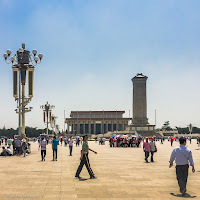 Since it was built, the centrality of Tiananmen Square made it the stage of several important protests that happened on the site, the last of which the "June Forth Incident" (六四事件). These are the 1989 student's revolt that in the West are known as the Tiananmen Square protests, forcibly repressed by the government when it declared martial law. Access to the square is now heavily controlled, with fences and security gates along its entire perimeter, and plenty of security cameras (zoom-in at the lamp post in the photo on the left), in part because of the terrorist attack that killed 5 people in 2013.